Buying a normal car is easy. Am I right, folks? You go down to the dealer, you pick out the one you want, you take it for a short test drive, and then BAM! You spend the next six hours arguing with the salesman about how you don't want those rubber floormats that get stuck on the accelerator. If only buying a Ferrari were that simple. As many of you know, my search began with the F355, a 1990s Ferrari that sounds great, and looks good, and drives beautifully, but has a few, uh, problems. I'm being charitable here because I know the people from the Ferrari forums will read this, and they're going to send me e-mails that say I'm a complete jerk, and an idiot, and a fool, because their 355 drives beautifully every single month, when they move it from the garage to the driveway to wax it. So I'm going to stop short of calling it the least reliable car in existence, largely because I know that title will forever belong to the Jaguar XJS V12, or maybe one of those Subarus with head gasket issues. (Also known as "all of them.") But it's pretty bad. What issues are we talking about? Well, for starters, there's the "major service." Now, this isn't like the "major service" in your BMW, where they replace a couple belts and top the fluids and ask if you want them to install angel eyes. No, no. Compared to the Ferrari, that would be a Teensy, Tiny Service, which would of course cost $961. In the 355, the "major service" takes place every four years and requires the removal of the engine. It costs six grand. Now, if that were the only issue, we wouldn't really have a problem. Since I won't own the car for long, I'll just buy one that recently completed the service and sell it before it needs another one. Right? The F355 also has a problem where the factory exhaust headers fail because they were made from some wimpy material that could only be devised by Italians. Probably glass. Replacements are $3,000 without labor, or roughly $1.4 billion when you factor in the work. And then there's an issue with the valve guides, which were made of bronze and routinely fail after a few years, or a few thousand miles, or if you look at them sternly. This typically requires an engine rebuild, which can be upwards of $10,000. Of course, there are also other miscellaneous issues. Just like any car, you have tires, and brakes, and the clutch. But unlike most cars, the F355 has plastic interior pieces that tend to get sticky as they wear. And I don't mean like Oh, you spilled some Coke sticky. I mean sticky like Seriously, why did you pour rubber cement inside your Ferrari? Replacing any of these things is a four-figure job. So before you buy a 355, you have to have it checked out by a mechanic. And you can't just use any mechanic. Oh, no. You have to have it looked at by a good mechanic, a Ferrari mechanic, someone who a) knows what he's doing, and b) charges approximately the same hourly rate as OJ Simpson's defense team. 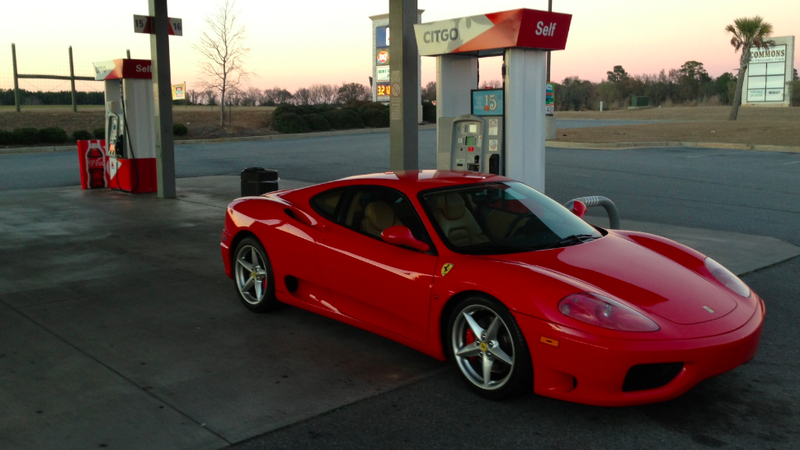 So I did that with Car #1, a red F355 located out west with an asking price of around $50,000. I called the private seller and we negotiated a selling price, conditional on the car passing an inspection at an independent repair facility located three miles from his home. "When can you bring the car over there?" I asked, cheerfully. "No way. That's too much of an inconvenience. You'll have to arrange for pickup." The Ferrari purchase process had begun. A week went by before I heard from the Ferrari mechanic, who informed me of two things: one, I owed him $450. And two, the car needs about $7,500 in work. There were a couple of minor issues (sticky interior parts and collapsed engine mounts), but the main problem was the valve guides. They had already been replaced, but they were starting to fail again. I paid for the inspection and passed on the car. A week into the process, I was out $450, and I wasn't any closer to finding a car. Back to the Internet. I started searching for a second F355 and found a good one at an independent dealer in Naples, Florida, that specializes in well-kept Ferraris. Car #2 was beautiful: a red over tan 1995 coupe with a fresh engine-out service, a full engine rebuild, and stronger aftermarket headers. The asking price was $65,000. Now, at this point I think we should have a word about my budget. Yes, it's true that I initially settled on $50,000 or so. But if I learned one thing while searching for a Ferrari (aside from "next time, buy an NSX") it's this: only suckers have budgets. I recognize that this may sound ridiculous, so please allow me to explain the logic. Let's say you go into the used Ferrari world saying you'll only spend "x" amount of money on a car. So you spend "x" amount, and you're happy, and you bring your car home, and you sit down for an evening of nachos and Gilmore Girls. But the car knows what you did. "Guys," the parts say to each other, in the night, as you're sleeping. "The person who bought us had a budget." And then they all start chuckling, and fail, one by one, until you've seriously considered selling your television to pay for tires. Is this a good use of your money? Hell no! Instead, you have to go in thinking: I want to buy a 355. And you have to throw your budget to the wind, because you'll want to buy the best 355 you can; the ones that have had all their bizarrely-named Italian parts replaced by bizarrely-named Italian mechanics who take union-mandated cigarette breaks every 37 minutes. So I got pretty serious about the $65,000 car, and even though the service had just been performed, I scheduled an inspection just to be safe. And then I waited. "I'm sorry to tell you this, Doug," said the guy at the dealer, over the phone. "But I sold the car today. Someone came in and bought it right out of the showroom." DAMMIT! I SHOULD'VE MOVED FASTER! I SHOULD'VE PUT DOWN A DEPOSIT! I SHOULD'VE BOUGHT THE CAR WITHOUT AN INSPECTION! I HOPE THE CAR CATCHES ON FIRE AND BURNS UP THE ENTIRE STATE OF FLORIDA AND EVERY SINGLE PERSON IN IT! I can be a little dramatic sometimes. So then I moved on to Car #3, also a red F355, which happened to be located at the same dealer as car #2. It was quite similar in a lot of ways, the main differences being that it a) had 3,000 fewer miles, and b) cost $10,000 more. I'm still not clear why it cost $10,000 more, since it was identical to the earlier car except for the odometer reading. This struck me as odd, since losing $10,000 in 3,000 miles is the kind of depreciation I had previously only associated with Jaguar. Regardless, now we're at $75,000. I decided to pursue it anyway. Now, at this point, I need to say something about rarity. You might be wondering: Hey, idiot! Why didn't you just find some other 355? I see seven of them every day, so they're not that rare! People always say things like this, and I find it incredibly annoying. Have you noticed this? You're talking with a friend, and you mention some especially rare car, like maybe the Kia Sportage convertible, and you say: "Haven't seen one of THOSE in a while!" And then your know-it-all friend says something like "Actually, I see them fairly often." And suddenly the only thing you want to do is buy a set of those rubber floormats and install them in his car. Anyway: with most cars, this wouldn't be a problem. Just select "coupe" on AutoTrader, and off you go. But the 355 is a different story, because 75 percent of used 355s are convertibles. Beyond that, I wanted a manual (nearly all '98 and '99 355 coupes were automatic), I wanted red, and I wanted a car with the aforementioned problems addressed. Factoring everything in, I was searching through a handful of cars in the country. And unfortunately, car #3 wasn't one of those cars. Just before I had it inspected, I learned from the seller that it still had the factory headers; the ones made from looseleaf paper stapled together in an Italian factory. I considered buying the car anyway (mind you, for $10,000 more than it was probably worth) and spending six grand to replace the headers, but even I deemed this insane. At this point, a month had gone by and I still didn't have a car. By now, desperation was setting in. You may remember this period, because I was a little tense. For example: people would ask me what car I was getting and I would reply with something like: WHY DON'T YOU SHUT THE HELL UP? WHAT CAR ARE YOU GETTING? OH, YOU HAVE A PICKUP? WELL GOOD LUCK CARRYING AROUND LARGE OBJECTS WITHOUT THEM GETTING WET! OH, YOU HAVE A CAMPER SHELL? WELL GOOD LUCK CARRYING A TREE! OH, YOU CAN PUT THE BED DOWN? HERE, WOULD YOU LIKE SOME ALL-WEATHER FLOORMATS? I visited the Lamborghini dealer. I considered an Aston Martin. I looked seriously at a Dodge Viper ACR. And then I decided to focus on the Ferrari 550. The 550, for those who don't know, is a front-engine, V12 Ferrari known for its beauty, its reliability, and the fact that Will Smith drove one in Bad Boys, but couldn't catch up to a fully-loaded car transporter. The first 550 I pursued, which I'll call Car #4, was located at an excellent dealership out west. It had every major issue addressed and it was in great shape, so I excitedly e-mailed the dealer. This was it! This was The One! A twelve-cylinder Ferrari! Just as Enzo had intended! But the dealer wouldn't come down from a somewhat inflated price. I found another 550, also in excellent condition – Car #5 – and promptly called. It had sold earlier in the afternoon. I seem to recall, at this point, thinking that maybe I shouldn't be buying a Ferrari. Maybe the stars were aligned against me, I thought. Maybe I should be focusing on an Aston Martin, or a Corvette, or some type of limousine that didn't start out as a limousine and was converted by some guy with a blowtorch and a lot of free time. That would make for some fun stories, I thought. Along the lines of: "Hey look! I bought an Acura Legend limousine! So cool, right guys? Guys? Why isn't anyone reading this?" It was at this point that I decided to search for the 360. Now, I'm not going to say that the 360 is the most attractive Ferrari in existence, because it's not. I happen to think the 355 is far more beautiful, as is the 458, and the 456, and a slew of other Ferraris with model numbers I'll never get my girlfriend to memorize. It's also a little expensive, in that it holds a huge price premium over its direct predecessor. And it's very difficult to find one with a stick shift. But it doesn't require engine-out servicing, and – more importantly – it doesn't suffer from many of the 355's problems. So I began the search. The first 360 I called on – Car #6 – was located in Knoxville, Tennessee. It hit all the right spots: red, coupe, manual, recent service. It had been listed on a Tuesday, and I called the next day. The price was high, but I knew I wouldn't find another one – especially so close. I told the seller I'd be up on Saturday to check it out, and he told me about how perfect it was, and how great it looks, and how much he'd miss it. On Friday, I called to confirm my appointment. It had sold. At this point, I think I only pressed on out of sheer morbid curiosity for what would happen next, but I'm proud to say that I purchased car number seven. It took two months, I switched models three times, and I went over my budget by a Camry. But I bought an excellent car, and I couldn't be more pleased about it. Once I got the 360 home, I took it straight to the dealer for tires, an oil change, and a general look around. While this was supposed to be a short visit, it coincided with Atlanta's recent snowstorm – and two days turned into two weeks. When the dealer called to say it was ready, I don't think I've ever been so eager to swipe my credit card for $2,000. You'd know this if you followed me on Twitter, where I've been excitedly posting photos of the car like a new parent with access to Instagram. @DougDeMuro is the author of Plays With Cars. He operates PlaysWithCars.com. He owned an E63 AMG wagon and once tried to evade police at the Tail of the Dragon using a pontoon boat. (It didn't work.) He worked as a manager for Porsche Cars North America before quitting to become a writer, largely because it meant he no longer had to wear pants. Also, he wrote this entire bio himself in the third person.